Attract website attention and hold searchers’ interest with search engine optimization copywriting by Dynamic Digital Advertising. DDA makes content optimization for search engines an important part of your search engine marketing strategy. With a team of talented search engine copywriters, Dynamic Digital Advertising is able to provide your company with copy that helps your website rank higher on major search engines such as Google, Yahoo, and MSN. both searchers and search engines. This type of content development uses a few highly-searched keyword phrases and generates full pages of coherent text. These pages are designed to attract the attention of search engines by providing copious amounts of information pertaining to certain keywords. Websites that feature a large quantity of high quality information are given higher search engine rankings. Dynamic Digital Advertising uses this ethical and effective form of search engine optimization to boost the optimization power of marketing copy on main pages. Sell your products or services to visitors while you sell your custom website to search engines. Content that markets only to search engines does not convince website visitors to do business with your company. Effective content development establishes a careful balance between optimization content and the marketing content necessary to motivate a visitor to take a call-to-action and become a customer, client, investor, or partner. Dynamic Digital Advertising maintains a staff of degreed writers who generate the content you need to rank high and increase sales. Call today; Dynamic Digital Advertising implements effective and ethical search engine optimization copywriting as a professional search engine marketing service. Some optimization companies put recurring lists and paragraphs of keyword phrases onto websites in hidden pages or code. Not only does this type of questionable optimization put your website at risk for search engine penalties, visitors who see these pages will usually abandon the website. Dynamic Digital Advertising is pleased to provide the search engine – friendly content you need for a higher level of natural Internet promotion. From our location in the greater metropolitan area of Philadelphia, DDA provides professional search engine writing for clients in a multitude of industries. Call DDA to learn more. Dynamic Digital Advertising is Philadelphias preferred custom website design company. Specializing in complete website design from ethical search engine optimization to marketing research to search engine optimization copywriting and much more, DDA relies on a professional, hybrid website design process. This process comprises fourteen individual steps that are geared specifically to earning higher search engine rankings on top search engines such as Google, Yahoo, and MSN. With DDAs professional web site development process powering your companys website, you are sure to earn a higher level of visibility and as a result a higher level of viability for your online business. 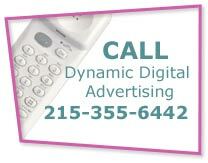 Dynamic Digital Advertising is a premiere graphic design company located in the greater Philadelphia area. DDA offers one of the most expansive offerings of graphic design services in the country. These services are composed of aesthetic web graphic design, graphic design for logo and corporate identity, large format graphic design, and graphic design for trade show booths, just to name a few. Dynamic Digital Advertising boasts a crew of degreed graphic designers who have worked with numberless companies from a large variety of industry segments and who create the attention-commanding corporate imagery you need to initiate a successful advertising campaign.